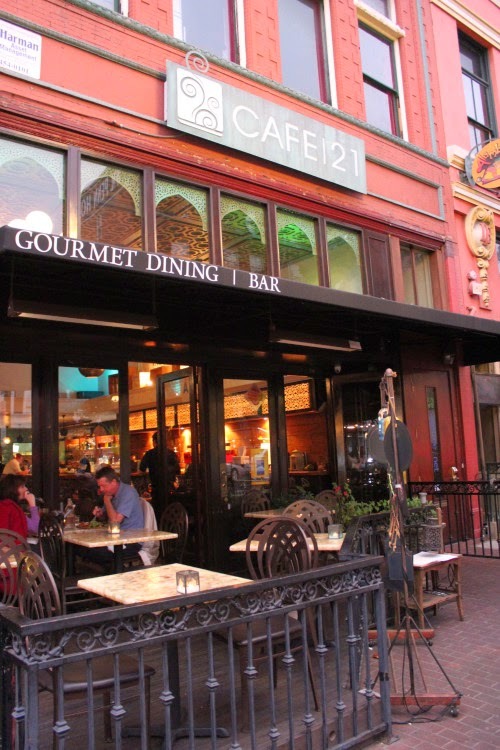 Cafe21 with little to no promotion, quietly opened the doors this week to its newest location in the former space occupied by Croce's in the heart of the Gaslamp Quarter. While the new space features the same locally sourced, organic, creative cuisine created by Chef Leyla Javadov at her University Heights location, the new Cafe21 will now be able to further accommodate the scores of people that find the wait worth it every week. The two-story, 4,000 square-foot restaurant is located on the historic corner of Fifth Ave and F Street at 802 5th Ave. and will accommodate up to 200 guests on its patio and indoor space. Cafe21's new location will promote weekly live music, as well as a Chef Leyla-created infused and seasonal cocktail menus featuring farm-to-bar concoctions. "We are delighted to open our new restaurant in a place that is so special to San Diego,” said Chef Leyla, “Our innovative, from-the-heart menu offerings are fresh, organic, local, fun and conscientious. Cafe21 will continue to guide its guests through a unique culinary experience every time they visit." Chef Leyla will also introduce an “Off-The-Wall" Mojito and a Margarita selection, similar to the current restaurant's characteristic sangrias, as well as delectable favorites served in a rustic chic atmosphere with inside and outdoor seating. Daily specials and a seasonal menu round out the offerings. Cafe21's hours are Sunday through Thursday from 7am to 11pm, and Friday and Saturday from 7am to midnight. For more information on Cafe21 and its locations, visit cafe-21.com.